I managed to make a little time for myself in the studio this week and finish most of the inking for the current piece. 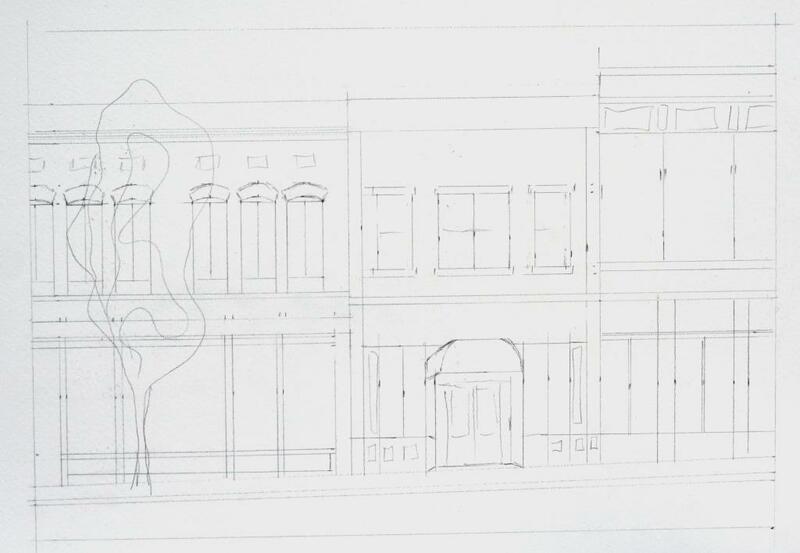 It is a pretty straight forward drawing, but I added greenery to the scene and changed some of the facades to add interest. I am going to use the pastels for color this time around. There will be a lot of red in the trim pieces and I want the depth of color that the pastels give. On the backyard front, I scared up Mr. Turtle yesterday while attempting to make a dent in the massive weeding chore in my flower beds. He was hiding in the tall crabgrass and, to both of our surprise, there he was, exposed to the sky when I pulled the weeds free. He scuttled away when I turned to toss them into the wheelbarrow. It was a surprise little visit and I am sorry to have disturbed his home, but the weeds really are out of hand. It will take another week or two to get the flower beds even moderately presentable. And I picked the first of the blackberries today. I got over a quart, with the promise of much, much more next week. I always thought that most of my artistic talents came from my mother, but thinking about my father since his passing, I realize that is not quite correct. My dad liked to make things with his hands. He was a fixer par excellence and, after retirement, he used that talent for his own pleasure. 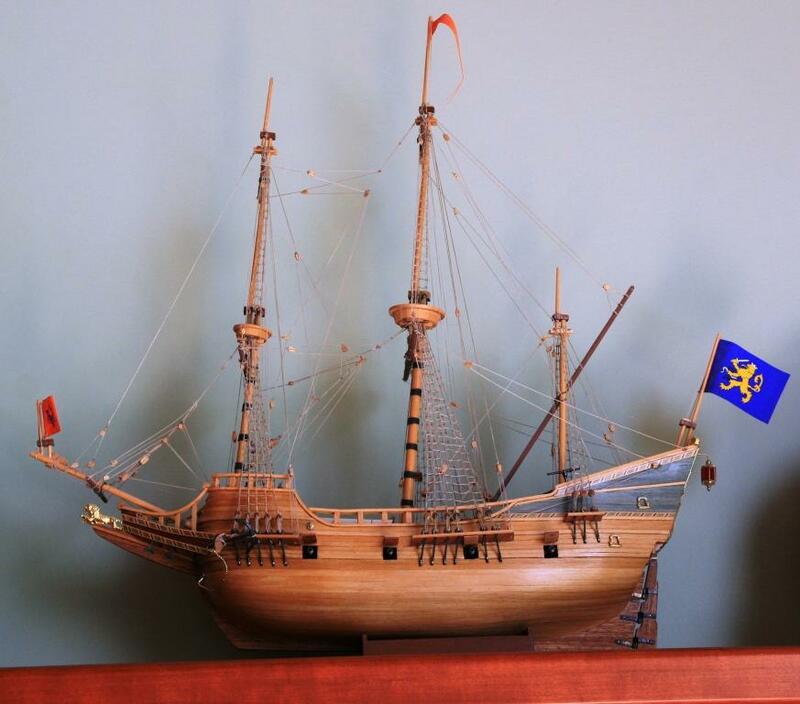 He spent many days, weeks, and months building scaled sailing boat model kits which ranged in size from 18″ to over 3 feet. All you had to do was pick one out of the catalog and he was ready to go. As you can see, the sail rigging was meticulously hand knotted and each and every little piece had its place. No shortcuts. He created a wide variety of balsa wood Christmas ornaments and by the end he was up to about 30 per year because everyone in the family got one. He built a 5′ canary yellow radio controlled Piper Cub sea plane which he flew once and safely landed out at his strip mine lake. He built and sailed a 5′ model of the battleship Missouri there too. It was always the process that he enjoyed. When it was done he was proud, but ready to move onto the next project. But I think he enjoyed making the house models the most. 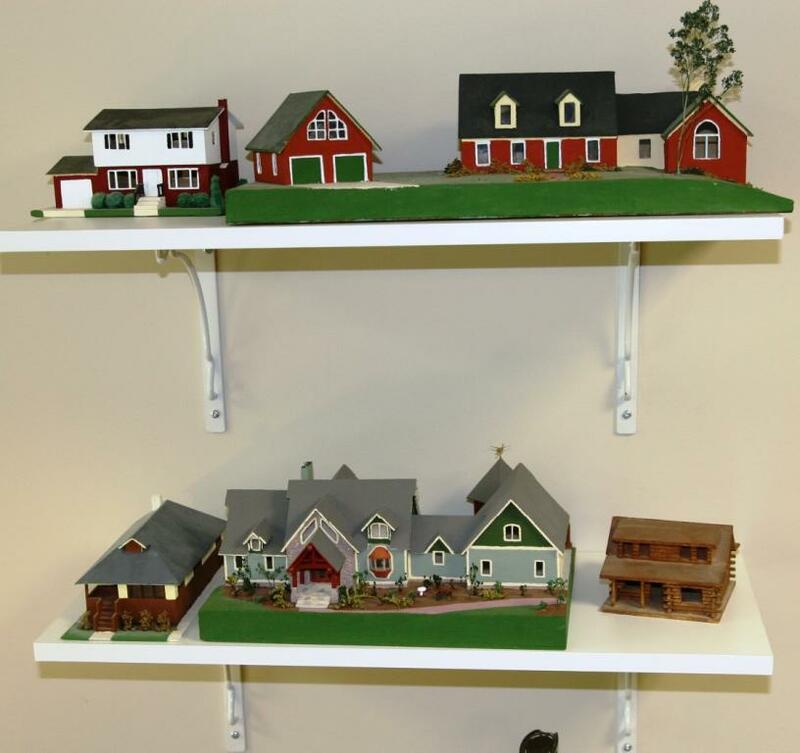 It all started in 1979 when he made a little scale model of our house as a Christmas ornament – a log cabin John and I built (mostly) with our own hands. After starting with that, he went on to make close to 100 more. There was the large courthouse in Arizona for his sister-in-law’s husband, the houses he and mom grew up in, all of their own homes, and of course all of the children’s and grandchildren’s homes. Add on the friends who loved the models and wanted one of their own. He was more than happy to comply. Summer was for working at maintaining the lake retirement home and property, but winter was the time those for indoor projects. He got quite sophisticated as the years went by, often taking his own photos when he visited as well as measuring the foundation. There came to be panes in the windows, railings on the decks, and trees and shrubs in the yard. Paint colors were accurately applied . My current house was not easy to do, but if you look closely, you can even see the crane weather vane on top of our gazebo. They are truly works of art that all of us will treasure as a reminder of him and the things he liked to do for the people he loved. Last Friday my dear father passed away at 84 following a brief illness, leaving a large hole in my family’s lives. But sometimes God throws in a bit of unexpected distraction to lighten the daily experience. Early yesterday morning as I was watering some plants in my garden window and thinking about the day’s difficult tasks, I looked out to the front flower beds. You will never guess what I saw strolling up the brick pathway. 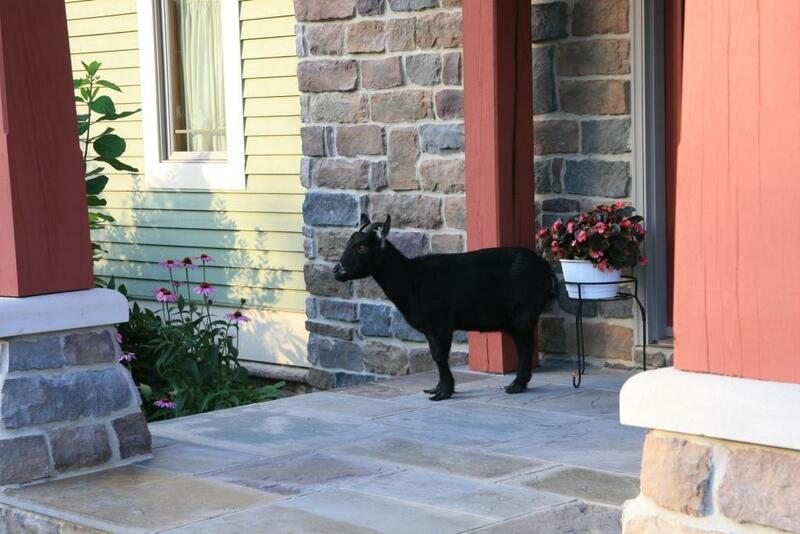 It was a small, black, horned goat. My son and I did a double take watching it walk the rest of the path and then step up onto the front door porch. I am sure it could hear us talking inside because when I went over to the foyer, I saw it peeking into the house through the sidelight glass. Talk about surreal. It circled the house after we went out to see it more closely and perhaps make a plan of action, but it became apparent that we needed more help. I had no grain to entice it and it didn’t seem interested in the offered celery. And it had a respectable pair of horns. Seen any coyote puppies lately? I rousted John out of bed and had him drive to a neighbor down the road who raises goats. It wasn’t one of his, but he kindly offered to come over to get it and take it back with him. So John, he, and his grandson proceeded to try to catch an unwilling victim. 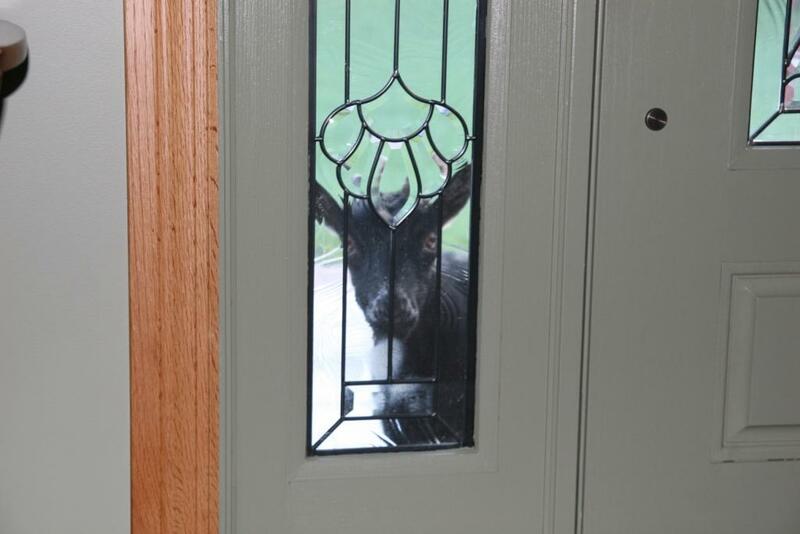 Goats are smart and for a bit it evaded capture. Finally, it made the fatal mistake of ducking into the garage where it was cornered and captured, screaming “you’re killing me” protests. They made a nifty little halter out of a lead line and carried it to the truck for transport. After one (almost successful) escape attempt over the side of the bed, they drove off with their prize. I don’t know what cosmic message was being sent, but I do know it brightened the start of my day and my mother laughed when I told her about it. And maybe dad did too. Just when I think I have it all figured out, life throws me a curveball. I thought the first of July would bring some regularity back to my life, but instead I have been concerned with a very ill close family member. After a week and a half there is a bit of a new normal and I am trying to get some studio time in just for my sanity. I had thought to be doing a series of smaller things, but with the ongoing events I don’t have the mental energy to make so many decisions. I picked out an architectural streetscape which I liked for the trim colors and will be working on it (probably slowly). I hope to post at least once a week for the time being. 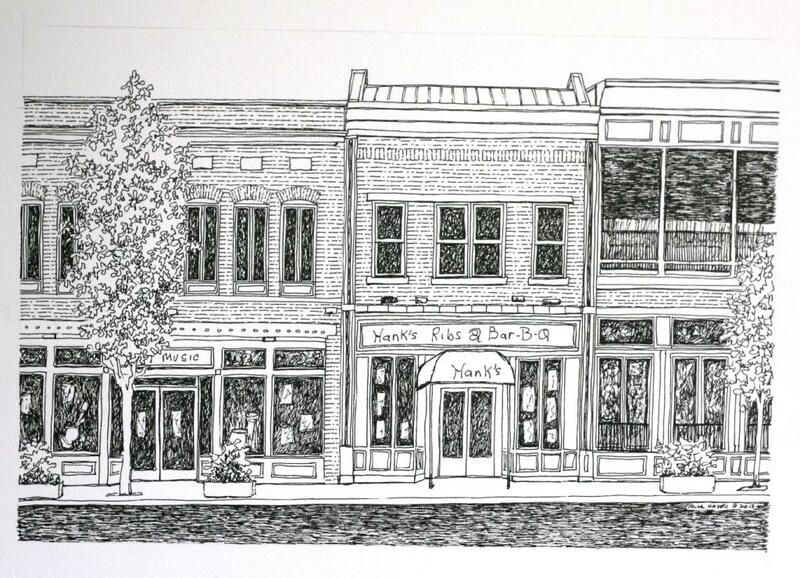 Here is the moderately finished pencil up of downtown Nashville. It’s pretty light but you can see it better if you click on it. When it comes time, quite a bit of the trim is a lovely red.